Arkansas record man Calvin Brown's greatest treasure was bluesman Calvin Leavy who's desperate "Cummings Prison Farm" was one of the very last down home blues to really hit big. 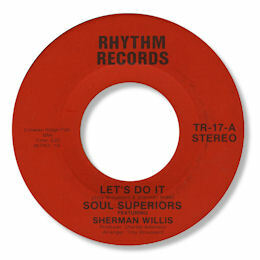 But right behind Leavy were the Soul Superiors whose lead singer was Sherman Willis. 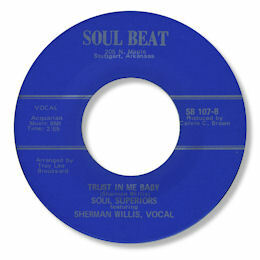 They cut two 45s for Brown on the first of which the fine southern ballad Trust In Me Baby was featured. This was a typically low budget production and a "little label" sound. The guitar from arranger Troy Lee Broussard is particularly notable but the drums are way too high in the mix and the horns too low. But all this just adds to the charm of the piece, as do some strong flexible vocals from Willis. Their second Soul Beat release Darling I Love You was a tasteful soul blues with a much better balanced mix and an even better vocal from Willis. Sadly the very rare Rhythm release is strident funk. Note ~ The Soul Superiors on Designer, Way Out and Warfell are a different group.